The Green Country Stormwater Alliance (GCSA) is a coalition of Phase I and II stormwater permitted cities and counties in northern Oklahoma. Founded in 2005 by INCOG, GCSA Members represent about half of all municipal stormwater permittees in Oklahoma. Membership is voluntary, with annual dues supporting all of INCOG’s professional stormwater services. This GCSA website provides a wealth of information for businesses and the general public, including technical resources for stormwater permittees. If you have questions about a specific city or county, contact the local stormwater staff listed in the GCSA Partner Communities webpage, or contact INCOG’s stormwater staff at stormwater@incog.org or by phone (918) 584-7526. Water Quality, Not Flood Control – The EPA stormwater permit program is about controlling pollution, not about controlling flooding. Untreated Rainfall Runoff – In Oklahoma, stormwater runoff does not flow to pollution treatment systems, it flows untreated to streams, ponds, and lakes. 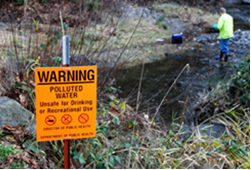 Wide Spectrum of Urban Pollutants – Bacteria, sediment, nutrients, metals, pesticides and other toxics can be found in stormwater runoff. Permitting Authorities– The U.S. Environmental Protection Agency (EPA) delegated its stormwater permitting authority to the Oklahoma Department of Environmental Quality (ODEQ), but EPA continues to have final oversight. General Permits – ODEQ issues three types of stormwater general permits: OKR05 for industrial activities, OKR10 for construction activities, and OKR04 for small municipal stormwater permittees. Coverage under each is obtained by submitting an application called a Notice of Intent (NOI), and preparing a Stormwater Pollution Prevention Plan (SWP3) for OKR10 and OKR05 coverage, and a Stormwater Management Program (SWMP) document for OKR04 coverage. Large cities (Tulsa and Oklahoma City) are permitted under individual permits. Important Acronyms – MS4 “Municipal Separate Storm Sewer System” is the city or county owned stormwater collection system that includes streets, gutters and ditches. BMP “Best Management Practice” is an action or structure used to help reduce stormwater pollution. Nonstructural BMPs include public education events, volunteer monitoring, and performing inspections. LID “Low Impact Development” is an action or structure that reduces the amount of rainfall runoff and pollutants; LID examples are rain gardens and sidewalks made with pervious concrete. What Are Phase I and II Permits? EPA’s 1990 Phase I rules addressed large cities (Tulsa and Oklahoma City) and 11 categories of "industrial activities" considered to be significant stormwater pollution sources. The 1999 Phase II rules addressed many other cities in Oklahoma. ODEQ is the permitting authority in Oklahoma for urban MS4s. Also included in stormwater permit coverage is any construction activity that has 1 acre or more of soil disturbance. Five-Year Permit Cycles for Stormwater General Permits – The ODEQ completed the renewal of OKR04 with a 5-year Effective Date of November 1, 2015. This is the permit under which all Phase II GCSA members are permitted. The OKR05 permit for industrial activities has a 5-year Effective Date of July 5, 2017, and OKR10 for construction activities will have an Effective Date of around September 2017. ODEQ publishes copies of its stormwater general permits on their ODEQ stormwater website.